The route goes on the left side of the wide corner, which vertilally cuts all the wall. The corner turnt into the lowering of the ridge between the summits Forossky Kant and Mshatka-Kaya it is a relative border between them. The last section of the route, going along the abrupt face with two small cornice а s, is the most difficult. It can be changed by the ascent by the easy upper part of the wide corner. In this case the route is downgraded in half a grade (variation). From the road near the alpinist camps under Forossky Kant move upwards 200 m along the path, then 50 m by easy rocks to the grotto, situated in the base of the corner (R0: 250 m, 20-40 0, б/к ). On the section R1-R2 from the grotto go upwards firstly on the right side of the corner, then by the nail slabs to the long horizontal ledge. Then (section R2-R3) traverse along the ledge 20 m to the left (R1-R2: 40 m, 70 0, III+ 20 m, 70 0, II). 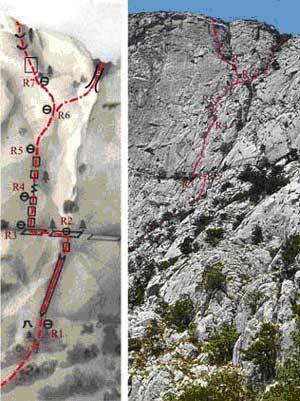 On the section R3-R5 go upwards by the abrupt, nail face with several cracks (R3-R5: 30 m, 75 0, V+ 50 m, 75 0, V). On the section R5-R6 go upwards and to the right by middle-grade rocks (R5-R6: 40 m, 70 0, III). On the section R6-R7 go upwards and to the left 20 m by easy rocks to the base of the big vertical corner (R6-R7: 20 m, 60 0, I). On the last section of the route go upwards by the left abrupt 30-meter face of the corner with two small cornices. The cornices are passed head-on (R7- the summit: 30 m, 80 0, V+). Variation (4B). On the section R6-the summit go firstly upwards and to the right to the big corner, bordering the summits, and then move upwards along it to the plateau (R6- the summit: 50 m, 60 0, I). Length of the main part of the route is about 230 m.
The route goes along the wide corner, which vertilally cuts all the wall. The corner turnt into the lowering of the ridge between the summits Forossky Kant and Mshatka-Kaya it is a relative border between them. From the road near the alpinist camps under Forossky Kant move upwards 200 m along the path, then 50 m by easy rocks to the red overhanging wall, situated not long to the right of the wide corner (R0: 250 m, 20-40 0, б/к ). 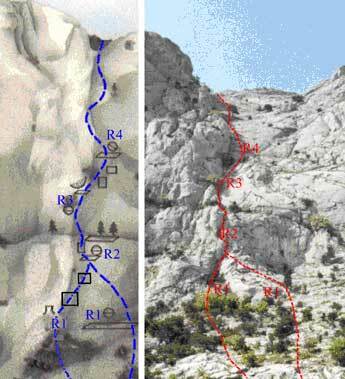 On the section R3-R4 go upwards by the slab, then go 20 m upwards and to the right (R3-R4: 40 m, 70-60 0, II-III). On the last section of the route go firstly 25 m to the left and upwards till the small couloir. Then go upwards to the big coiloir overgrown with bushes. Go 25 m upwards along it till the plateau (R4- the summit: 120 m, 50-60 0, I-II). Variation: On the section R1-R2 from the grotto go upwards firstly on the right side of the corner, then by the nail slabs to the long horizontal ledge. (R1-R2: 40m, 70 0, III+). Length of the main part of the route is about 240 m.
Time is 2 – 3 hours. P.S. 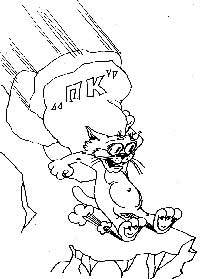 The full name of this route isn't «The right edge”, but “П----ц котенку”. This informal name was given by the FA Dnepropetrovsk students, who got into a scrape on this route.